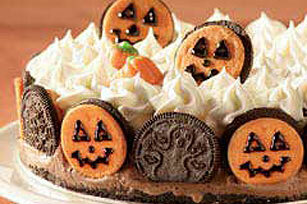 Chocolate and vanilla ice creams layered in a crumb crust are decorated with sandwich cookies, whipped topping and candies for a Halloween treat. Split 17 of the cookies, leaving filling on one side of each cookie. Finely crush the 17 split cookies without the filling. Place in medium bowl. Add butter; mix well. Press firmly onto bottom of 9-inch springform pan. Stand 15 of the split cookies with filling around side of pan, alternating filling sides facing in and out. Spread chocolate ice cream evenly over crust. Chop remaining 5 cookies; stir into vanilla ice cream. Spread over chocolate layer. Cover; freeze 3 hours or until firm. Run knife or metal spatula around side of pan to loosen dessert; remove side of pan. Spread or pipe whipped topping onto top of dessert. Using colored decorating gels, make pumpkin faces on orange filling on the split cookies around side of dessert and 2 remaining split cookies. Decorate as desired to resemble pumpkin patch with assorted candies and remaining split cookies. Serve immediately. Enjoy a serving of this indulgent treat on special occasions. Cut dessert between cookies to the center of dessert for 15 equal slices. To quickly soften a quart of rock-hard ice cream, microwave on MEDIUM-LOW (30%) for about 30 seconds or until slightly softened.